Melisa and Evan’s San Francisco wedding marked many firsts for me. Theirs was the first wedding I booked once moving out to SF. Theirs was both the first engagement session and wedding that I actually photographed right here in the city. And on a personal note, it was my first cable car ride! With all of these firsts, you’d better believe that I was pretty excited for their wedding day. The weather couldn’t have been more perfect. San Francisco is known for it’s “June gloom” which is a cute way of saying “cold, grey and windy”. Fortunately, it was anything but, with blue skies and sunshine (and a bit of wind) all day long! 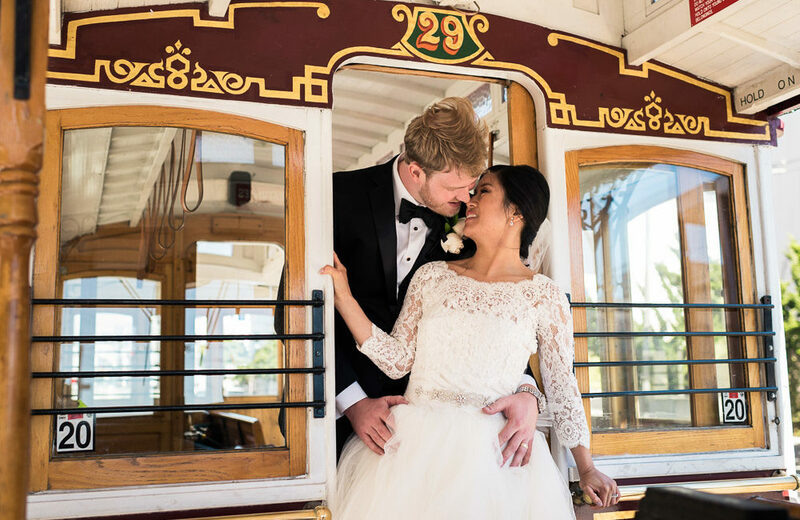 Between the cable car ride to and from the church, outdoor photos and an outdoor patio cocktail hour, Melisa and Evan certainly took advantage of the beautiful day. Regardless of what the weather was doing, it still would have been a beautiful day because of all of the friends and family who gathered together to celebrate the beginning of Melisa and Evan’s happy life together. Tears were shed, hugs were given, friends were made and memories were created. Congratulations Melisa and Evan! Thank you for giving me so many San Francisco firsts. I’m so glad I was there for your first day as husband and wife! If you missed it the first time around, here’s Melisa and Evan’s San Francisco engagement session! Haley and Bryce Got Married!